Hi guys, welcome back . 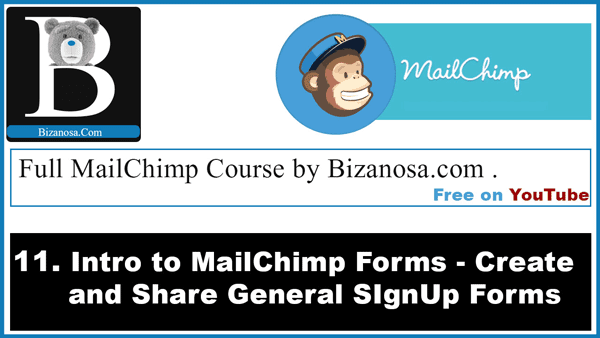 In this coming series we’ll take a look at Forms in MailChimp . So to take a look at Forms , First of all we want to go to the Lists tab. So we want our Forms for this List. Forms are the subscriber Forms , the opt –in Forms , the welcome email form. All those are forms . In this part of the series we’ll take a look at General Forms , Embedded Forms and Subscriber PopUp. So to get started we’ll start with the general forms. This is where all the Forms in MailChimp, The possible Forms, all of them are here. Well Let’s say all you want to do is create a link where people can subscribe to you. You will give them, the link or you can put the link on your website or on your Facebook page and people click on it and they go and subscribe. If that’s all you need then this is a good place to start. As you can see the form is already created based on the fields we had in our list. When we imported a List, we had email addresses, we had First Names, Second Names, Locations and Titles. So the first thing I would love to do , is to show you what I mean by you just take the link and share it . So if I take this link and open it on Chrome , here is the Form now that you can use. Well we haven’t edited it. We’ll edit this Form. For now I just want to show you that you can just use that link and people will subscribe to you. Let’s say we click that, you will see that this is required, the rest not really. For my case I want to remove the location and the title. So let’s go back to this area, and see how we can do that. You can duplicate a field . So if you want to duplicate this field, you just click on that one and it will duplicate this field. You can see the field has been duplicated. Then I’ll click on this to delete it. And as I said, I want to delete the Title Field and the Location Field. So I will just do the same thing for this other one. Well the other way of deleting , you can select this and you will come here. You see there is this other area. This is where you can change the names. If you want to change the label for location into something else, you will come here and give it the name you want . If you want this to be a required field, you can come here and make it a required field. If you want a default value, for example you want to show people, if this was a telephone number, you want to show people the format of how to put the phone number , this is where you’d put that sample. If you want the field to be visible / hidden you can choose that here. But in this case we don’t have any transactions that would need to be hidden. If you want to delete… okay we wanted to delete location , you can also come here and click delete. You must confirm by typing in Delete. Then you confirm that. As you can see on this end, you can add as many fields as you want . If you are creating a registration where you want people’s details. You can create a field Date of Birth . Just click on that and it will come here . If you want to make people add their website, the field for URL will be added there . Just Click here. Yeah, everything you will need is here. If you want some kind of a number field , a field whereby Maybe people are inputting age, just come here and click that. If you want people to select certain items, a radio button . You have all that here . So Basically everything. You can create a larger form than this , it doesn’t have to be small. But if you are looking for subscribers, it’s advisable to keep the form as minimal as possible . Okay I want to make the first Name to be mandatory. So I will come here and check, “Required Field” … Then I’ll come here and save. Ensure you save. Then I want the email, the email is already required but I want people to know that it is required. So I’ll come here … then I’ll save that. So you can see this is how it will appear . So the next thing I want to work on is the design. I want to add a header image , and just show you how you can change the background color. SO you’ll click on the “Design it” At first we were Building it, putting the fields that we needed, removing the fields that we didn’t need. Now you come to “Design it” and you check what you want to change. All I need to change here is this text, I want to use a different image You can change the Background color here. Let me just show you how that goes. I don’t have any color in mind so let me just choose one from here. So if I choose this color, come here and input that. If you want to brand your Form according to your website , then you can use the colors that you use on your website. SO you’ll just come here to change the background color. The next thing I want to change is just the header. This is the header, I want to use an image. I want to upload one. If you want to use one from a URL you can input the URL, but I want to browse on my computer and change the image. Well there we go. It’s done. Click select . So if you want to link, If you want the header to Link to something, you input the link here. So for me I want it to link to Bizanosa.com. Don’t forget to put the protocol. Height..width ..yeah…that’s okay…”Save and Insert Image” . Okay . So from what you can see, the background of the form is making the image look weird. I will have to change it back to some form of grey. Background….I will change it back to this color. Okay, that’s much better. We’ll stop from here and then we’ll resume from this point in the next video.